There are several types of biopsies available to help diagnose mesothelioma, including surgical and non-surgical options. There are three types of biopsies; non-invasive, minimally invasive and surgical. A biopsy takes fluid or tissue samples for analysis in a lab. Multiple biopsies may sometimes be necessary to receive a definitive diagnosis. An early diagnosis can offer patients more treatment options and a better prognosis. Currently, a tissue or fluid biopsy is the only way to ensure a patient receives an accurate mesothelioma diagnosis. During a biopsy, cells are removed from the patient’s body and analyzed to determine whether or not cancer is present and to provide a definitive diagnosis. If the disease is found, a biopsy can help an oncologist stage the disease, estimate a mesothelioma patient’s prognosis and lay the groundwork for a comprehensive treatment plan. There are three primary types of biopsies: non-invasive, minimally invasive and surgical. The goal of each type of biopsy is to gather enough tissue, fluid or cells to determine whether cancerous cells are present and how far the disease has progressed. In most cases, biopsies are performed following blood tests and imaging tests to confirm a diagnosis. Non-invasive biopsies are performed using a small- or large-bore hollow needle to draw a fluid sample from around the organs, including the lungs, abdomen, and heart. The fluid is then tested by a pathologist to determine if mesothelioma cells are present. These procedures may also be done as a form of palliative care to relieve pain, reduce fluid buildup and help patients breathe more efficiently. The type of biopsy needed largely depends on where the fluid is, and requires only a local anesthesia to numb the skin prior to the procedure. Unfortunately, needle biopsies don’t always provide an accurate diagnosis because they can only collect small clusters of cells and tissue for testing. Patients are likely to undergo further testing to receive a diagnosis or eventually rule out mesothelioma. When a patient undergoes a minimally invasive biopsy, also known as a endoscopic biopsy, the surgeon will make a small incision in the body to insert a camera. Using a camera like an endoscope, they can examine the area where the incision is made and take tissue samples for further analysis. There are three types of endoscopic biopsies used to confirm a mesothelioma diagnosis. Doctors use an endoscope to examine the chest cavity. During Video-Assisted Thoracoscopic Surgery (VATS), a surgeon can also check a patient’s lymph nodes for abnormalities. Several incisions are made in the abdomen to insert a laparoscope, a thin tube with a light and camera. Inert gas may also be pumped into the abdominal cavity to increase viewing space. An incision is made in the chest between the neck and the breastbone to examine for mesothelioma in the mediastinum, the area in between the lungs. This form of biopsy is done in an operating room under general anesthesia. Other procedures may also take place during an endoscopic biopsy. For example, during a thoracoscopy, a pleurodesis may be performed. The surgical procedure removes pleural effusion, or excess fluid in the lungs, and can alleviate symptoms for pleural mesothelioma patients. A patient becomes a candidate for a surgical biopsy when other tests have been unable to definitively determine whether malignant mesothelioma is present. In situations where a surgical biopsy is called for, the surgeon makes a large incision in the body, gaining full access to the chest or abdominal cavity. Biopsies of this type are done under general anesthesia and recovery time can take several weeks. Depending on where the biopsy needs to be taken from, different forms of surgery are recommended. A laparotomy is used to examine the abdomen for tumors and can help a specialist diagnose cases of peritoneal mesothelioma. Thoracotomies, which take place in the chest, are used to diagnose pericardial mesothelioma or pleural mesothelioma. This requires an incision several inches long in the abdomen and may result in a surgeon taking large samples for further study. A surgeon can also try to remove as much of the tumor as possible while the surgery is taking place. A more in-depth option compared to a thoracoscopy, the surgeon makes an incision in the chest to assess the lungs, heart and surrounding area to determine where the cancer may have spread. Once the tissue or fluid sample has been collected, it is sent to a lab for testing to determine if mesothelioma cancer is present. A pathologist first does a gross examination of the sample and records their findings, then the samples are prepared for analysis. This is done by concentrating the cells found in a fluid sample or by getting tissue samples placed on glass slides. Pathologists use cytology and histology to determine cell type and whether or not mesothelioma cells are in the provided sample. This test is performed on cells taken from fluid samples during a non-surgical biopsy, such as a thoracentesis. Cytology focuses on the cell function and structure, which can help doctors determine how the disease may progress and react to treatment. This process involves studying tissue specimens under a microscope and using different stains to identify the presence of mesothelioma cancer cells. Pathologists perform several tests on the tissue samples to help them come to a definitive diagnosis. Once the tests are complete, the lab will maintain these samples for future reference. This is important for patients seeking a second opinion or in instances of cancer recurrence. According to the American Cancer Society, labs must hold onto biopsy samples for several years to stay compliant with federal Clinical Laboratory Improvement Amendments (CLIA). Some states have additional laws requiring samples be held even longer than federal guidelines mandate. If a patient is diagnosed with malignant mesothelioma, a specialist will develop a personalized treatment plan based on the individual’s case. If the cancer is diagnosed at an earlier stage, patients typically have a number of potentially curative treatments, like surgery, available to them. However, a late-stage diagnosis may provide only palliative care options. 1 American Cancer Society. What happens to biopsy and cytology specimens? Updated July 30, 2015. 2 American Cancer Society. 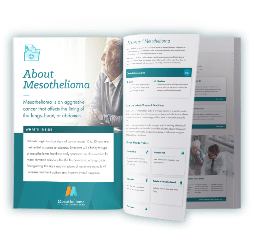 How is Malignant Mesothelioma Diagnosed? Updated February 17, 2016. 3 American Lung Association. Diagnosing and Treating Mesothelioma. Updated April 4, 2018. 5 Apgar B. Diagnosis of Malignant Pleural Mesothelioma. American Family Physician. 2000;61(2):536-539. 7 Penn Medicine Abramson Cancer Center. Mesothelioma Diagnostic Tools and Tests. Page last modified on September 19, 2018.